Hi everyone!! 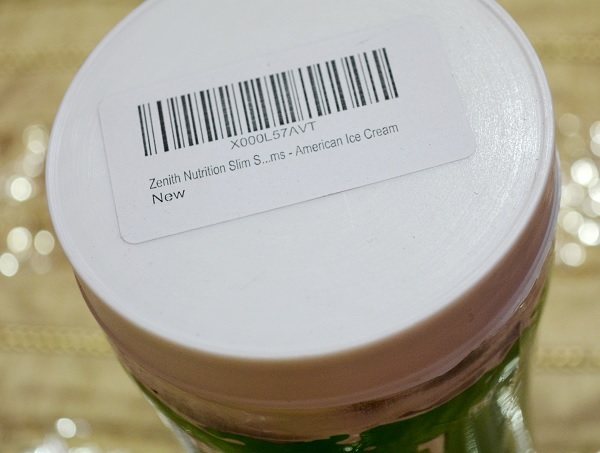 I will review this Zenith Nutrition Slim Shake in the flavor American Ice cream. I must say that this is one of the best protein shakes that I have used. The last one was used by my husband and I too had that. This one I am going to try. It can be consumed by men and women. 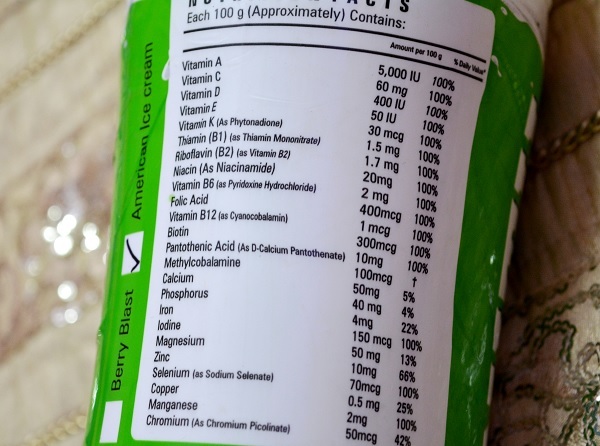 This is more of a protein shake which you can have to fulfill the protein requirements and to fulfill the need of the other vitamins and minerals. No Rocket Science: Losing weight is not rocket science, the main thing that we ignore is understanding the needs of our body to achieve our goal. Well Toned Body: Help's you achieve a well-toned body at a faster rate by getting rid of unwanted ingredients that we intake such as Fat. No Belly Fat: Whey protein & Soy protein with essential Amino's helps to build Lean muscles and not belly fat. Also contains Probiotics which help in accelerating GI immunity. Supports Digestive Health: Rich blend of fibers both soluble & insoluble derived from soy & Fructo-oligo saccharides (FOS), helps in digestive health. Overall Health: Herbal blend of Green tea, Garcinia & Acai, helps in accelerating immunity, metabolism & loss of appetite. 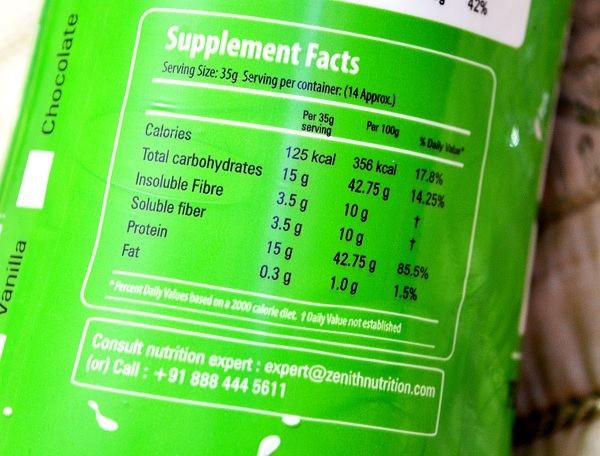 Other ingredients: Soy fibre, maltodextrin, milk powder whey protein concentrate, soya protein isolate (supro) vitamin mix, flavours, probiotics, herbal extracts(green tea extract, acai fruit, garcinia extract) and added flavour natural sweetener. The protein shake comes in a white and green colored big jar. This is a 500 gm pack. The price is okay. This protein shake looks light brown and has to be dissolved in the milk. I take a glass of milk and would put two scoop of this shake. The flavor American Ice cream is very nice. It is indeed delicious. The vanilla one was also good but I liked this one more. Take one serving of 35g or 3 scoops with water or juice or non fat milk like the skimmed milk. This can be taken once or twice in a day. I take only once but can be taken twice. 1-2 servings a day along with health controlled diet and exercise regime will help to achieve, a well toned lean body. This is a rich blend for whey protein and soy protein with essential amino acid to build lean muscles. 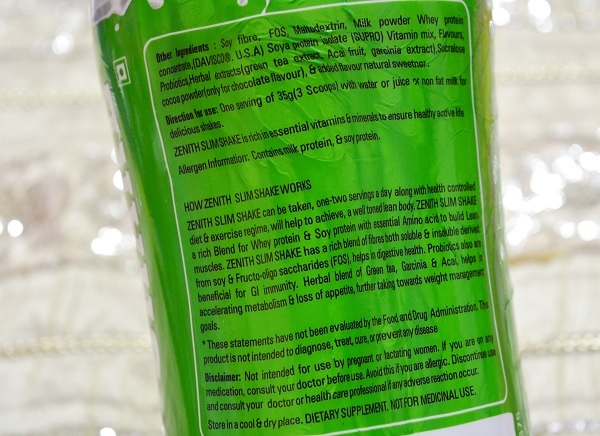 Zenith slim shake has a rich blend of fibres both soluble and insoluble derived from soy and fructo-oligo saccharides (fos), helps in digestive health. Probiotics also are beneficial for Gastro-Intestinal immunity. It also has the herbal blend of green tea, garcinia & acai, helps in accelerating metabolism & loss of appetite, further taking towards weight management goals. How to use zenith slim shake for healthy weight loss? If you would like to use this for getting slim then too this can aid in weight loss. You can replace one meal preferably breakfast with 3 scoops (35 g approx.) 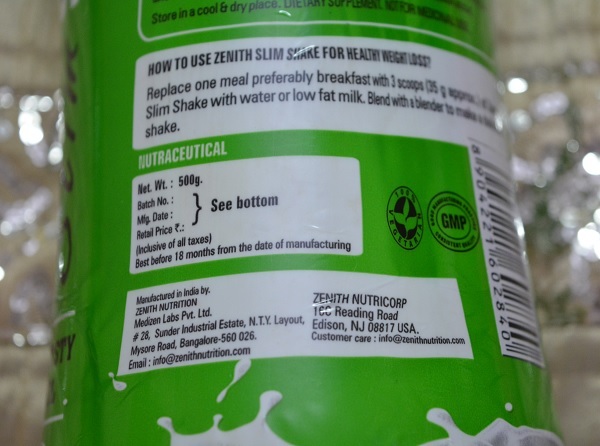 of this zenith slim shake with water or low fat milk. You can also blend with a blender to make a delicious shake. 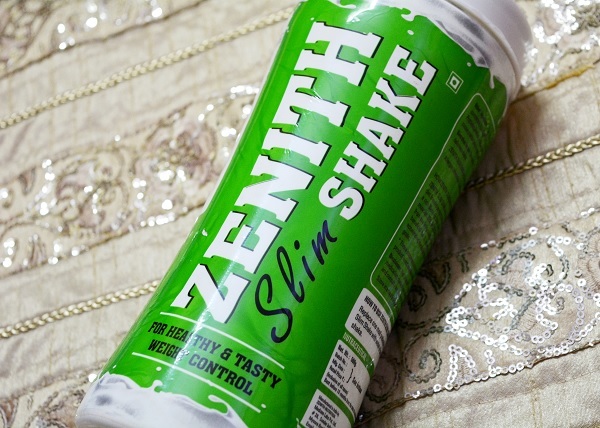 Zenith slim shake is rich in essential vitamins and minerals to ensure healthy active life.